New York’s heat wave finally let up this week, allowing thoughts of fall’s style staples begin to creep into mind. Before we know it, we’ll be pulling out our lightweight sweaters, scarves, and boots to start dressing for the new season. While on the subject of fall footwear, there was a noticeable trend on the F/W 16 runways that we suspect will come to be a major player in the shoe department in a couple month’s time. Prominent brands like Chloé, Derek Lam, Dries Van Noten, and Proenza Schouler all showed low-shin ankle boots in an array of colors and textures. For us, this length feels subtly fresh and—even better—completely wearable. If you’re starting to shop out your fall wardrobe (most sites are already carrying their autumn products, including the Who What Wear collection at Target), then consider the 22 picks in today's market roundup. We searched high and low for the best low-shin ankle boots for you to wear for fall, and made sure to include a range of price points as well. Ready to buy a pair for yourself? See below to stock up! 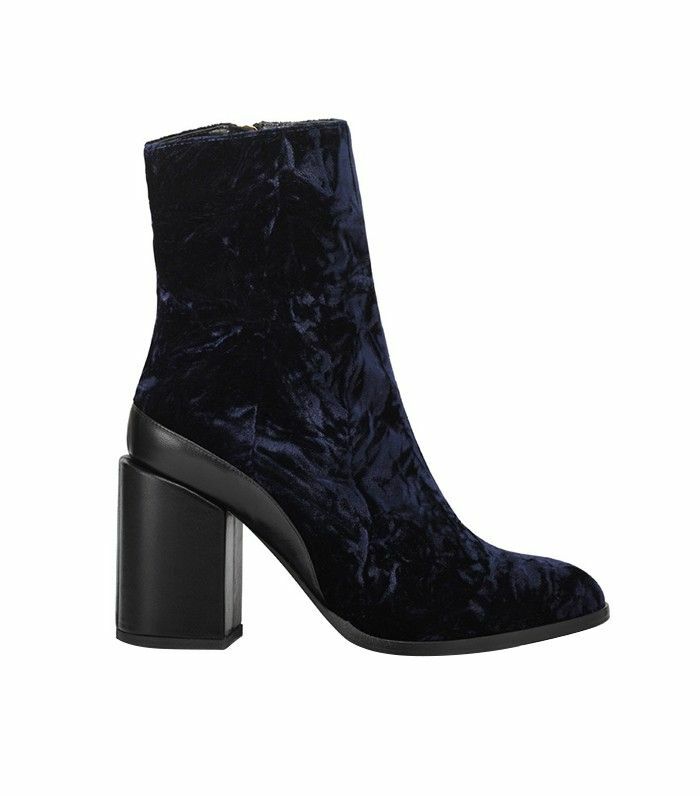 The coolest way to embrace velvet for fall. This color looks literally perfect with blue jeans. The perfect balance between classic and statement. We'd wear these with a ballet pink midi dress. We want to be Gucci girls! Patchwork footwear always feels special. How regal is this shade of purple? These look way more expensive than they are. A dotted cap toe is a playful update to a classic detail. Everything from the gathered fabric to rounded heel makes these boots a smart pick. So fresh and so clean (keep them that way!). Style with a white button-down shirt and cropped flared jeans. Circular hardware is a subtle nod to the past without feeling overly retro. Contrasting heels are one of our favorite footwear trends. That asymmetrical zipper is delightful. For the high-heels kind of gal. A brilliant shade of blue to make your other shoes jealous. These cost a pretty penny, but they're practically artwork. Every fashion editor has their eyes on these beauties. These are almost 50% off—enough said. Want more fall trends? See what we predict to be huge in street style.